Baybáyin is NOT an Alphabet. Baybáyin is an Abugida (Alpha-Syllabary). Using Baybayin characters online like typing your status on facebook or in a chat client is a different story. Online, Baybayin fonts requires using the Unicode range which is normally not easily accessed by your regular keyboard. The Unicode range can only be accessed using a specialized program like an online tool/application or by changing your keyboard's layout settings. Other's names: If the word is a name of person (or organization) - don't Pilipinize the spelling and don't write it in Baybayin Script, use the Latin Alphabet instead - unless that person (or group) made known to you or the public how they write his/her name in Baybayin (or they personally requested you to do so); how one prefers their name spelled & pronounced is a personal issue. Your own name: Again, "How one prefers their name spelled & pronounced is a personal issue." No person (or translator tool) should dictate to you how you want to spell & pronounce your name. People can suggest alternative spellings, in the end it's up to you to figure out how the rules of orthography (spelling) fits how you want others to read or pronounce your name as. Place names with no commonly known official direct translation to Filipino should not be translated to Filipino, it should be written the way it is known internationally in the Latin Alphabet. If you should insist on transcribing it in Baybayin, even if there is a Filipino translation for certain words in the name - don't translate it - just Pilipinize the pronunciation before transliterating it to the script. 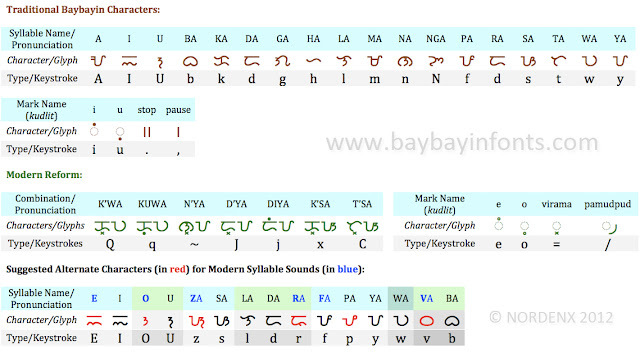 For example: Long Island, New York should be written in Baybayin as ᜎᜓᜅ᜴ ᜀᜌ᜴ᜎᜈ᜔ᜇ᜴ ᜵ ᜈᜓ ᜌᜓᜍ᜔ᜃ᜴ (Long Ayland, Nu York) instead of ᜋᜑᜊᜅ᜴ ᜉᜓᜎᜓ᜵ ᜊᜄᜓᜅ᜴ ᜌᜓᜍ᜔ᜃ᜴ (Mahabang Pulo, Bagong York); because even though the later transcription makes sense as a literal translation, that place name is virtually unrecognizable. The first phonetic transcription leaves the name recognizable and logically a sound choice. how do you write "Mabuhay"?